This will be an IC for thick PBT dyesub sets, in classic (Light grey mods & beige alphas) base color. Profile will be Cherry. Originative Co. will be handling the logistics (Taking orders, shipping, etc). I will be assisting in the design phase. Pre-orders will be done on his storefront. Until then, I will be the POC, and following the pre-orders, Originative. We are targeting to make this available at USD 70-90. (NOTE: At this stage the languages (Legend options) have been decided on, so please do not request other layouts, they might happen at a later date, but no this round. We can discuss these elsewhere. I'll be working with the community to ensure the legends for the foreign characters are correct weight, size and aligned for the final set. What we are looking from you are the different legend color/color combinations you'd like to buy. These kits looks good, but are there any chances for a no OS specific key? Like a Diamond, Star, GH, or something like that? We had a similar discussion on another thread, most likely, we'll be sticking to the classic monotone win key for the Classic, Arabic and Cyrillic sets. Japanese will get a big dot and rose of sharon for the Hangul. 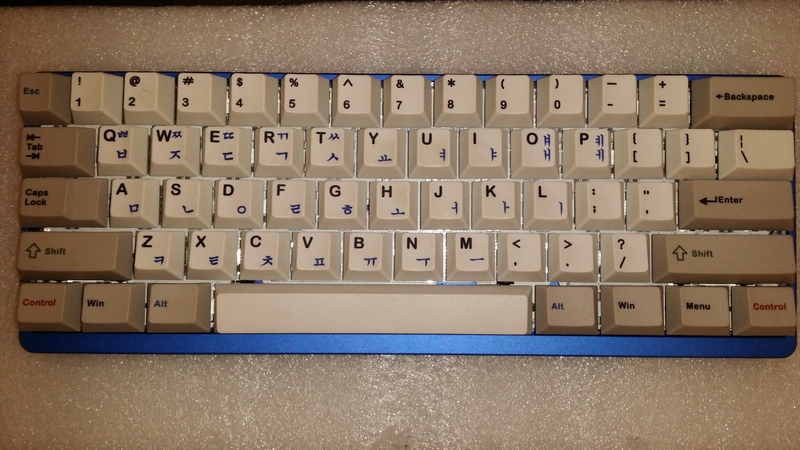 If the Hangul fonts aren't a bunch of twigs like EnjoyPBT's current caps & the Japanese set doesn't look like the PBT4 one that would be great. They'll be different, we'll be using a more oriental version of the Hangul font. For Japanese well be using a slightly thicker version of a Gothic font, one that matches the Cherry legends in weight. I don't need more sets.. especially after EnjoyPBT.. but I do love those windows keys. I am interested, glad to see HHKB layout support! Nick these only work on MX boards, not Topre. so will this japanese set happen? Black and blue Arabic would be perfect. And there's a few Topre mx sliders out there. Yes, that's the Japanese font we'll be using. so will the hangul keycaps look something like the imsto hangul cherry keycaps? Yeah, that's the default MS font for Hangul, Gungsuh, which we'll be using. sweet c: is there an estimate on pricing rn? Oh nice, finally a source for hiragana caps. If the price is not GMK-level I'm definitely in. Any idea how much that's going to cost? I can't comment on exact pricing, I'll ask Sheraton to chip in with that information, but I can tell you it most likely will be sub-$100. We deliberated about ISO, complete 1800 support, etc, but decided on the current offering to keep the price as reasonable as possible. A shame, would buy if there was a nordic/ISO kit. As I mentioned in the OP, *not making any promises*, we will try to get a supplementary kit for ISO users that they can add to their main order. ISO enter is a bit of an issue. I will definitely order a set if arabic is an option. I would love black english alphas with blue arabic sublegends personally. Noiceee if the colors don't clash and the font is nice and thick like that, I'll be in for a set. Love your mockups! This could be promising. Are you still working out the details, or do you know who will be doing the dyesubbing? Would dark blue and deep red match Olivetti and Red Alert colors? Always interested in another source of these! Who would be the manufacturer btw if you don't don't mind me asking? Ah okay. Must have missed that. i like this, but what about BSP PBT instead of enjoyPBT? BSP PBT is more comfortable and more expensive. I will be in for a Hangul and probably a hiragana. And while it probably wouldn't end up being popular enough, I would really, really like the Hangul set to be purple/cyan. Just throwing that out in case anyone thinks like I do. yes ,i know BSP has less keys and some crooked keycap moulds(already improving a lot). i have seen and used PBT sets made from the author of enjoyPBT on Sublimation. He does pretty well on Sublimation and is good on sublimation technique but is limited to the inferior enjoyPBT. BSP PBT has higher quality. we could choose BSP as main keys and enjoyPBT as secondary choice which BSP doesn't have. That & they don't make 1.25 ctrl + alt etc. I don't use em but a lot of people do compared to wkl. I have many BSP sets, classic beige style with black, blue, green, or red legends! Sets only include 85 keys with no space bars. Yeah, but I'm not in the US right now. It's a little hard to ship. I'll update more soon. Page created in 0.26 seconds with 73 queries.